Remember last year’s chicken and waffles potato chips? 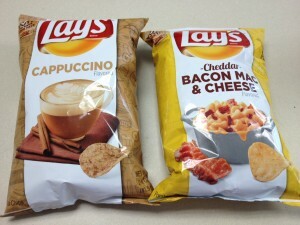 This year, Lay’s has 4 new crazy flavors and I felt obligated to try them (oh, the things I do for the Flog). Cappuccino – The chips were dusted in coffee, sugar and cinnamon. This is the closest I have ever had to a dessert potato chip. Not a winner. Bacon mac & cheese – It was a cross between the smokiness of a BBQ chip and a sour cream and onion flavor. It was decent and I would eat it again. 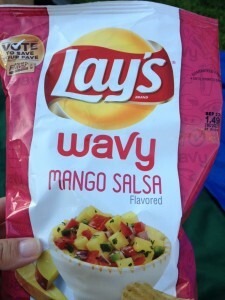 Mango salsa – This was the big loser – no one liked the odd faux fruity flavor. It tasted like fruity pebble cereal dust on a chip. 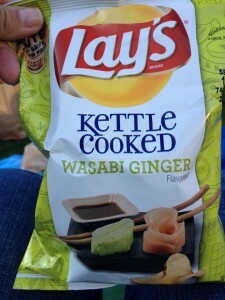 Wasabi ginger – People really liked the unique flavor combo and actually finished the whole bag. There is a kick from the wasabi, tempered by a hint of ginger. I really hope this one wins.